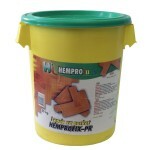 Use: It is intended for gluing of all kinds of parquet floors. Composition: It is single component glue made out on the base of polyvinyl acetate. Method of application: Before the use stir the glue thoroughly.It is applied with a serrated trowel, by drawing it in one direction. After the drying period from 10 - 20 minutes the gluing process of parquet can begin.The full glue bonding is attained after 2-3 days. Coverage: From 0.8 - 1.2 kg/m2 depending on substrate.